Affordable Accoutrements: Ornamental Kale! For Thanksgiving? It's almost Thanksgiving. It's a time when I love setting beautiful, traditional holiday tables with delicate etched stemware, silver candelabra, fine china, and vintage lace or damask table linens! But ... that's not what THIS table is about. I decided to try something a little more contemporary. While I did use vintage Haviland china and Gorham flatware, I've incorporated potted bedding plants, Dollar Tree placemats, chunky Crate & Barrel plates (used as chargers), simple oversized wine glasses, and faux "planter boxes." I also wanted to share a simple craft project. 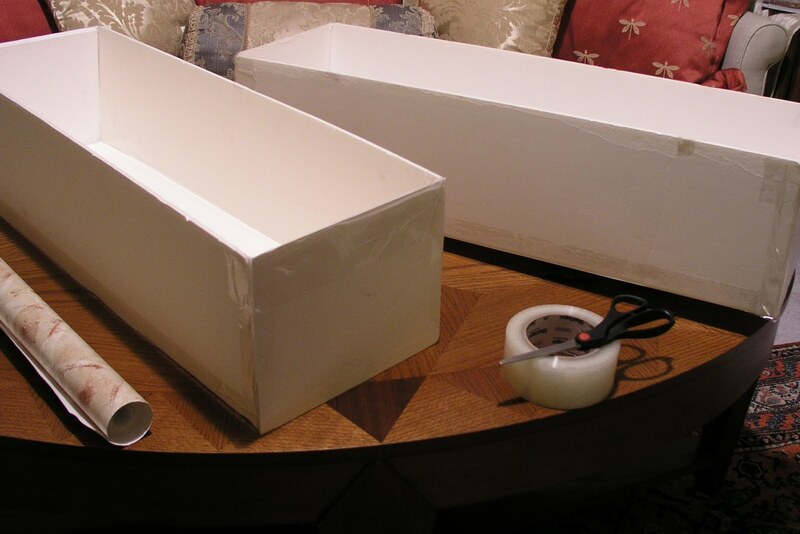 Since the ornamental kale plants used down the center of the table will be planted outdoors, they remain in their plastic pots, hidden in boxes made from foamcore board and packing tape. The size of the boxes was determined by measuring the height and diameter of the pots. I used a professional mat cutter to cut the foamcore, but you could also do it with a straight edge and a utility or Exacto knife. I covered the boxes with thrifted wallpaper, using tape (rather than paste), so the paper can easily be removed and replaced for future projects. I also enjoy using wallpaper for wrapping gifts. It comes in an endless array of colors and patterns, and the weight offers durability and a very nice tactile quality. I've found full rolls of wallpaper for as little as a quarter or fifty cents in local thrift stores. Since this paper has an obvious "repeat," I cut the paper so the patterns would line up in the same place on both boxes and on both sides of each box. I didn't worry about how it looked on the bottom or inside the boxes, since I knew those areas wouldn't be visible after the boxes were filled with plants. Here's the view down the center of the table. I found the plants on sale at Kroger for only 75 cents each. I alternated the green and purple kale and placed an ornamental cabbage in the center. I temporarily planted the cabbage in a pumpkin and used raffia/rope garland to cover tops of the pots and the soil. The garland was one I used on a Christmas tree several years ago (I try my best not to throw anything away -- you never know when it might come in handy!). I lined the foamcore boxes with tall kitchen trash bags to keep them clean. The china is Haviland Ladore, and the silver is Gorham's La Scala. The sherbet glasses are vintage Fostoria -- Silver Flutes, introduced in 1949. It was a mostly cloudy day. I left the camera on a tripod, just in case the sun peeked out long enough to take a few photographs. It did from time to time (usually when I was upstairs, and just long enough for me to almost make it to the camera!). But I did manage to take a few shots that revealed the delicate beauty of the durable outdoor plants (hardy down to 5 degrees Farhenheit, if properly acclimated!). I painted the pumpkin with a thin layer of Titanium white Liquitex acrylic paint. While it was still wet, I added feathery strokes of gold liquid acrylic paint to tone down the whiteness and add a little bit of shimmer (which is there, but really didn't show up in the pictures). I bought several orange pumpkins at Wal-Mart for fifty cents each (reduced the day after Halloween). I saved the seeds from the one I painted. Perhaps I'll grow my own next year. I actually swept the deck before I took pictures, but additional leaves rained down throughout the afternoon. Oh well -- looks like autumn, right? I hope you enjoyed your visit, and I hope you have a wonderful Thanksgiving! Please join Susan of Between Naps on the Porch for Tablescape Thursday. Always a pleasure to stop by and see what you are sharing. Bill, you are right this is a departure for you. However, this beautiful tablescape still reflects the elegance of all your work. I like the understated look of this table because Thanksgiving is about people. You have created a table that does justice to the treasured china and silver but bows to conversations about memories and treasures of the soul. Love the natural elements of the kale and the way the candlelight reflects off the boxes. Sir, you are the artist. Oh the table looks so nice with the candlelight. 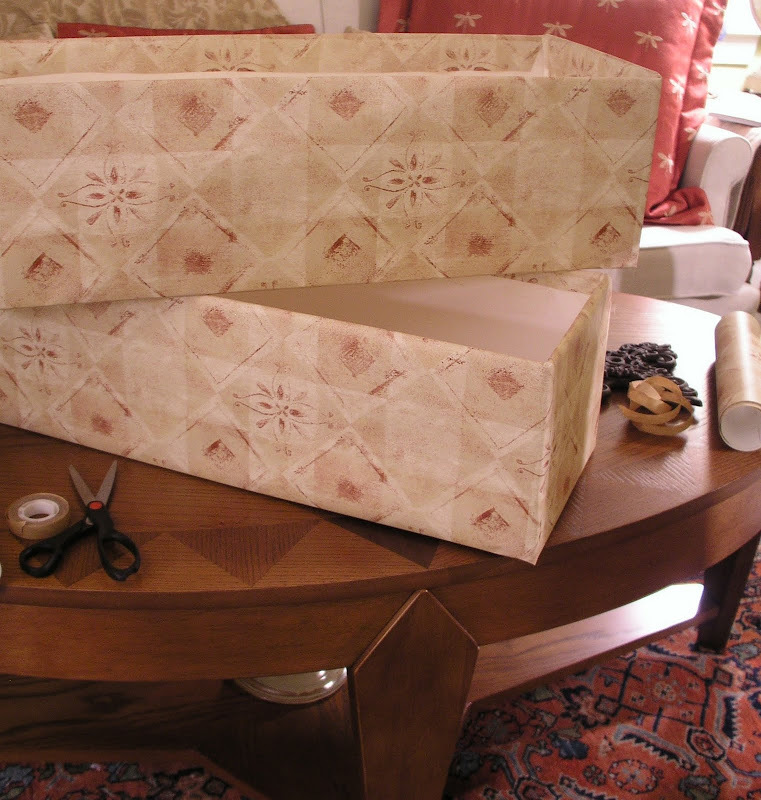 and thanks for the great idea about using wall paper for wrapping paper and for wrapping those boxes. Happy Thanksgiving to you and yours. How lovely! Adore the boxes you made,great idea using wallpaper,and the plants look wonderful! The wine glasses, the china is beautiful! Your very talented Bill! Beautiful and very interesting table decoratio, i lake it!!! Kisses Bill and Happy Thanksgiving. Breathtaking, Bill! The kale is stunning in the boxes you made, tucked with raffia here and there. As always, your table is perfection! The kale looks beautiful lined up on your table in the boxes...love the idea of the wallpaper and it coordinates so well with the rest of your tablescape! The pumpkin looks fantastic. I think your table is wonderful in all the photos, rainy day or not. Out weather is much the same! Wishing you a wonderful week and Happy Thanksgiving! Just lovely. I like the mix. We will be with friends for Thanksgiving and then the day after I will start to decorate for Christmas. I have several tablescapes in mind! I love it Bill! What creative ideas! So incredibly beautiful and full of texture and awesome ideas! I love when you lit the candles, just stunning! And that china is so delicate and so pretty, what a wonderful Thanksgiving table! This is so pretty! I love it with the candles lit. Any suggestions for a tiny cottage table? We are celebrating at our cottage and I would like to make it special. Stunning and what a creative idea to use something that will actually be used later for nourishment. Bill, you've outdone yourself~! This is one of my very favorite tables by You. Beautiful! You are just so creative...the centerpiece is so pretty. Everything just sparkles from the dishes to the silver to the crystal. A great project. What a great idea... I love how the paper blends with the dishes. Your table is wonderful. I am grateful to have seen it. Happy Thankgsgivings Bill. HEY Bill!!!! Im your newest follower and LUUUUUUUUUUUUUUVIN it! In fact, i cant bring myself to leave your Blog!!! Everything is GORGEOUS!!! WANT IT ALL!! I found you at Lynnes...LOVE HER! You are a ROCKSTAR for sure! That table setting...BANANAS about it!!! I have an Interior Design Business and blog ...im doing 14 days of xmas trees and would BEYOND ADORE you to visit! I have a GIVEAWAY to! Hope you have a happy Thanksgiving. Bill, Another gorgeous tablescape! I love how you decorated the table with kale and you got quite a deal on it. It's $5.95 each at our local nursery. Everything is beautiful! Here's to your Frugal Fancy! Nicely done -- again. Happy Thanksgiving to you and yours. Oh how beautiful. I love the kale...I keep thinking I will plant some outdoors in the summer and I never do. Sadly, we get below 5 degrees so it wouldn't survive a winter here. I love the idea of covering the boxes. I like to use wallpaper to line drawers in my dressers. We all give you praise for your tablescapes, but I think we forget to praise the photography. You always capture the best night shots! The table looks beautiful, candlelight stunning, greenery so creative; but must say my favorite thing is the faux planters!! LOVE THEM -- Great idea! And may I wish you and yours a wonderful and blessed Thanksgiving, Bill! Absolutelly and totally a beautiful elegant Thanksgiving, tablescape!!! The home-made planters and plants are very different and perfect...my favorite...the stunning Havilland china dishes! Happy Thanksgiving to you and yours Bill. Gorgeous, Bill! I am a big fan of using fruits and veggies for decorating, and you knocked this outta the ballpark!!! If you actually grow pumpkins next year, you are totally my hero! Have a wonderful Thanksgiving!!! I love kale and cabbage at this time of year. It looks fabulous as your centerpiece. So smart to craft the boxes. It is all beautiful. Have a Happy Thanksgiving! Clever idea, making your own boxes which can be reused. You have once again out done yourself. Beautiful table as always. Wow!! Amazing!! Love the boxes and lifts in the middle of the table. Great table. Love how you're challenging yourself to add a contemporary slant. I just became a follower...I could spend hours on your blog! You are very blessed with creative ability! Beautiful table, and the kale boxes are a great addition. Happy Thanksgiving! Beautiful setting....hope I am invited for dinner!....and remember, I still want your lovely home!! Bill, gorgeous table & love the kale. Happy Thanksgiving to you! Absolute stunning, Bill. I love your centerpiece idea and arrangement. Everything combines for a perfect display. Hi Bill, wishing you a very Happy Thanksgiving, and stopping by to say how much I enjoy your tablescapes. I'm now a new follower! Love the creative use of the ornamental kale, and your table is beautiful. Bill...I always enjoy my visits. Your table is stunning and I love all the ornamental kale. This was a great project and turned out very well! I love the kale and the raffia...great organic look! Those Haviland Plates are very pretty and I love the LaScala silver pattern is beautiful! I love the warm glow created with the votives...great job! Still one of my favorite centerpieces. So creative - I would have never thought of it. That beautiful tablescape still reflects the elegance of all your work. The understated look of this table because Thanksgiving is about people. You have created a table that does justice to the treasured china and silver but bows to conversations about memories and treasures of the soul. Those natural elements of the kale and the way the candlelight reflects off the boxes, is too good. Tulips, Magnolias, and Cupcakes! For Halloween?